In the Studio this week we’ve designed a striking document for Destination Southampton, ready for the Venturefest conference – being held today, 29th March at the Ageas Bowl! Our client, Destination Southampton, approached us with a brief and quick sticks deadline to create the document and we were only too happy to help. The 5-page document is an introduction to the gorgeous 80-page Hampshire Conference Guide, also produced by Glow; and will appear in the partner directory at Venturefest – the one-day conference for innovators, entrepreneurs and investors. The Hampshire Venue Guide features (as you’d expect) venues from across the whole of Hampshire. 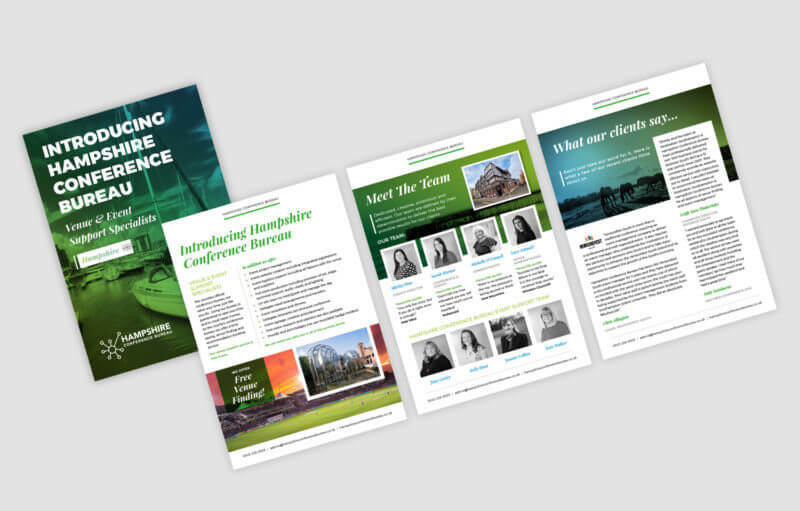 It follows the same design theme as the Southampton guide (another Glow document ) and uses an alternative colour palette in accordance with the Hampshire Conference Bureau brand. The design remains visually intriguing, using an editorial design and in an A5 format. Venturefest is an annual conference which brings together the region’s innovators, entrepreneurs and investors to showcase the latest technology, share thinking and explore new ideas. The interactive one-day conference features great speakers, seminars and workshops and valuable pitching sessions, as well as demonstrations of the latest technology and innovations. It’s a power packed event and Glow will be visiting, embracing all that is on offer. And, of course leafing through the Hampshire & Southampton Destination Guides! Destination Southampton offers a time-saving meeting, conference, venue finding and planning services for businesses wishing to host a conference or event in the Hampshire region. Impressively boasting over 250 venues, and the capacity to accommodate over 2000 delegates in the largest venue, this year the team are celebrating its 20th year.